Accurate temperature control, rapid solution switching and fast wash-out. Maintain bath temperature and rapid drug wash-out with a high-flow bath line while quickly switching 4-8 preheated solutions through the Perfusion Pencil® Steady 37°C at 5 ml/minute flow rates through both the bath line and tip. Fuzzy logic PID software maintains chamber or reagent temperature to within 1°C of setpoint or better. The ThermoClamp calibrates its own tuning for ideal temperature control – no need to guess “loop speed” settings. No metal anywhere in the flow path – unlike some competitors. Low noise for electrophysiology with internal and external grounding plus electrical isolation between liquids and heating elements. Includes everything you need for heated perfusion: power supply, temperature sensors, and inline heater with easy Luer lock tube connections. You can have rapid switching, fast wash-out, and accurate temperature control at the same time. Set the ThermoClamp temperature from ambient to 50°C. 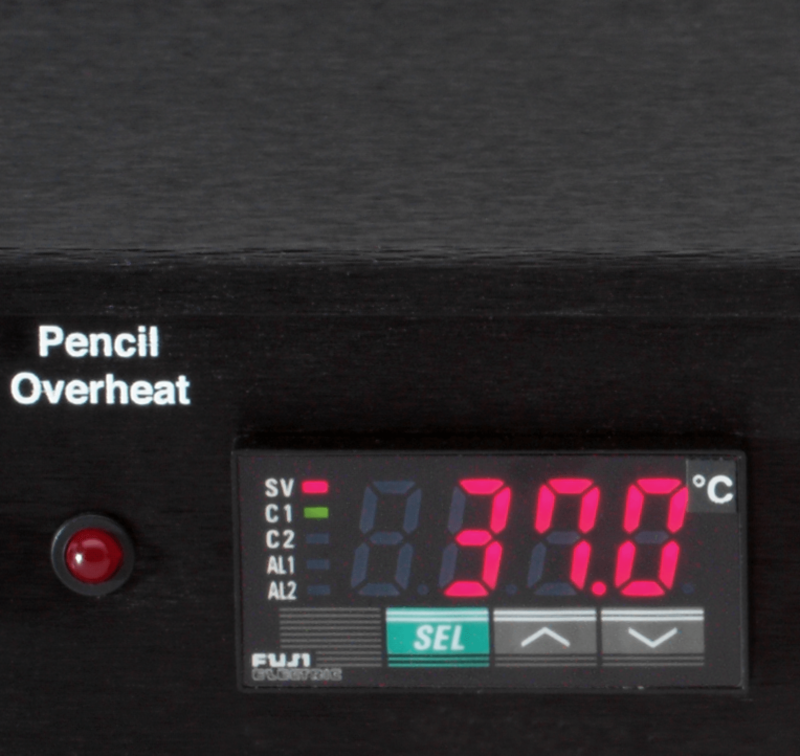 A front-panel BNC provides an analog output of current temperature for recording. Different sizes of replaceable tips are interchangeable with our standard Perfusion Pencil. The tips have microliter dead volume for rapid switching. 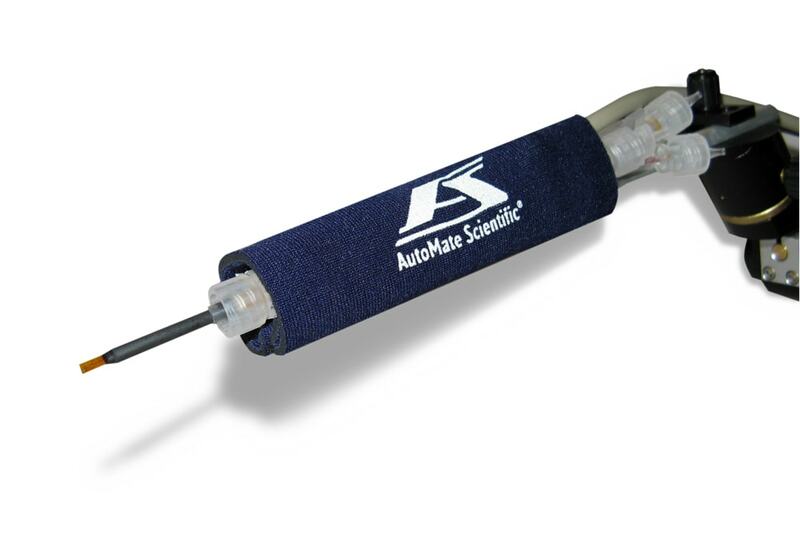 See ThermoClamp Flow Rates on the Perfusion Pencil. No messy water jacket is required, but the separate high-flow line is capable of heating a perfusion chamber with water jacket if desired. Do you need to change your prep’s temperature over the course of an experiment? A programmable “ramp and hold” feature can automatically vary the setpoint over time. 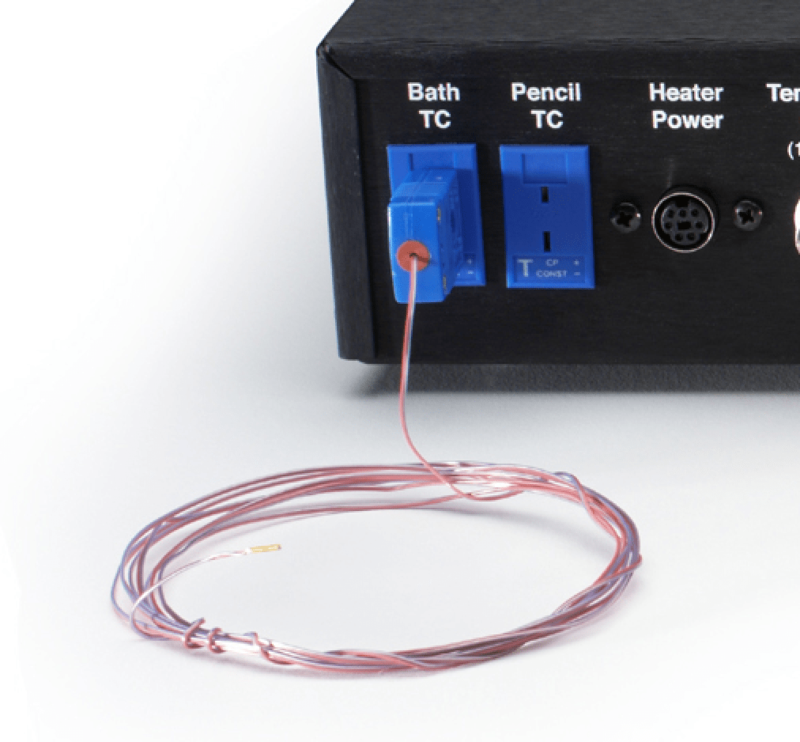 The ThermoClamp system includes bath and Perfusion Pencil thermocouple sensors. Automatic overtemp and thermocouple failure protection alerts you to any problems. 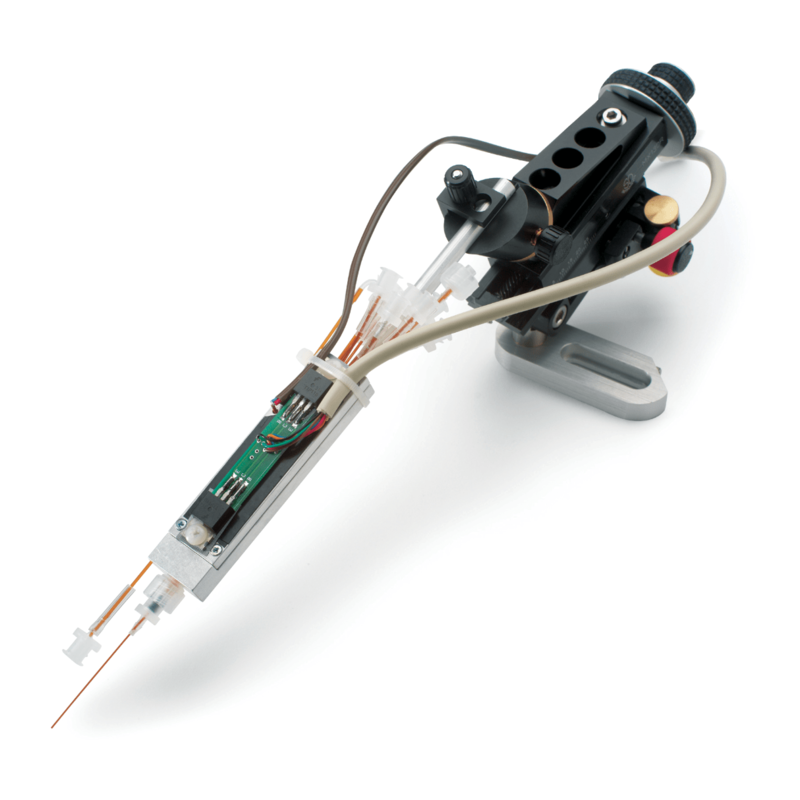 Incorporate temperature control into your perfusion rig with simple micromanipulator mounting. Connect multiple reagent tubes from any perfusion system to the heated Perfusion Pencil on a manipulator directed into your chamber. If desired, connect a separate buffer line to the “high-flow” bath Luer connection on the Pencil, and the outflow to your chamber. If your chamber includes a water jacket, you can use the high-flow line with a constant flow of water to heat the chamber. Place the bath thermocouple sensor in the chamber. Set your desired temperature on the controller and begin liquid flow. The ThermoClamp will monitor bath temperature and heat the liquids flowing through the Perfusion Pencil to keep the chamber at exactly the desired temperature. Your perfusion system can quickly change solutions through the Perfusion Pencil tip and also deliver buffer for fast wash-out. 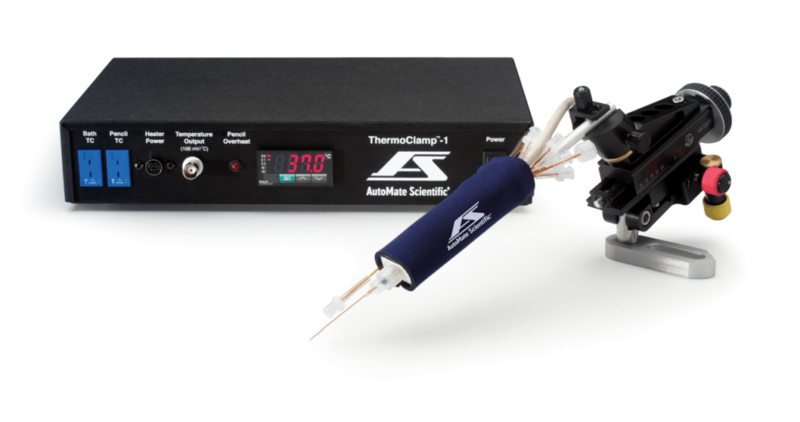 Sophisticated circuitry will “auto tune” the ThermoClamp heating parameters based on your flow rates, chamber, and tubing to clamp the temperature and minimize over/undershoot. New dual-channel ThermoClamp-2 for simultaneous heating of Perfusion Pencil® inline heater and microscope stage. All AutoMate Scientific Perfusion Pencils (ThermoClamp, SmartSquirt® and regular Perfusion Pencils) are now available in a “Zero Dead Volume” configuration with all internal tubes extended 2 cm out of the tip. The “ZDV” Pencils do not use removable tips since all of the tubes go all the way to your prep. This eliminates the possibility of backflow and decreases solution switching times down to nearly zero. Easy Luer-lock connections and manipulator mounting. Thermodynamic design maintains temperature with 5ml/minute flow from both tips without any metal tubing. Separate chamber bath and Perfusion Pencil thermocouples included. Low noise – designed for electrophysiology.